3D Mechanical Modeling is the process of developing a digital representation of any 3 dimensional object with the help of specialized 3D software and the output of the process is called a 3D Mechanical model but it may also be depicted as a 2D drawing. Perspective views can be created from any desired angle. Our Mechanical Engineering CAD team can create your product concept from free hand sketches/ drawings to an intelligent digital prototype utilizing various 3D software. We undertake 3D modeling assignments for various automotive parts, mechanical devices, heavy engineering equipment, consumer durable items. 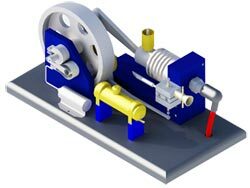 Advenser produces 3D Mechanical Modeling services in the form of spectacular visualization and prototyping. Our mechanical modelling team is capable of empowering you to convey your design concepts to your customers covering even the minutest details with absolute perfection. Advenser mechanical team is constituted by extensively skilled resources and the most advanced technologies available in the industry. Our mechanical services include mechanical design and drafting, 3D CAD modeling, mass modeling, CAD conversion, product drawing, isometric drawings, assembly modeling, etc. Our team has extensive experience and expertise in handling various types of mechanical cad projects of different budgets and complexity. We have executed 3D projects for diverse range of industries as well , including residential, commercial and industrial sectors. We ensure that the drawings are delivered as per the industry standards and appropriate formats & layouts as required by the client. We have a specialized mechanical drafting team to provide professional drafting services to all kinds of residential and commercial buildings.